The peculiarity of the capitalist society is the commoditization of every one of its aspects: each object, activity, even "thought", has a relation with money and is, therefore, a commodity. If "the detail labourer produces no commodities" and if "only the common product of all the detail labourers becomes a commodity" (objects become commodities only outside factories, on the market), there’s a powerful contradiction within the production and circulation of commodities which, indeed, stands as a breakdown element, as an element of negation of the prevailing current society, a threat about the presumed eternity and immanence of capitalism. As previously often specified, we do rely on Marx’s reading to produce our work, especially within those pages examining the dynamic succession of social forms, the extinction of old categories and the metamorphosis of the invariant ones. Thus we base ourselves on the certainty of the fact that the extinction of the present society and the consequential rise of the new society have to already be inscribed within the current one, no matter whether humans are aware of this process or not, as it was when they began to produce handicrafts, distinguishing themselves from the animal kingdom. Within this prospect, the peculiar task of communists is either to identify problems and contradictions of the capitalist mode of production and to harmonize with the material movement which, by definition, a constant surmounting of the present. Indeed there is no utopian creation of new categories from scratch. During its birth and development, capitalism has progressively grown its contradictions together with the conditions which will lead to its explosion; it unceasingly produces the instruments (both human and structural) for ditching itself. We are quite confortable in foreseeing its future as we are looking at a stone thrown in the air. Notwithstanding this doesn’t exempt us from the necessity to comprehend what its major contradictions are. Before starting our search, we ought to be aware that our attempt would be pointless if we didn’t know for sure "what to look for". An experimental research is out of date since knowledge has started to be memorized, transmitted and cumulated outside the biological cycle: now human researches are based on consolidate theories as from a known element to reach a previously foreseen, intended or presumed result. A good example is given by the location of Pluto, the last planet of the solar system, which couldn’t be possible through a simple observation of the firmament. To do that scientists used the astronomical theory on perturbation over Neptune's orbit in a precise yet known point of the outer space. Fortuitous discoveries are for sure possible within the scientific field, but still they are inscribed in a structured and oriented work. Similarly, when our theory states that the negation of the present society is a recognisable data we can now acquire within the actual system of production and circulation of commodities, it implicitly shows us where to look for it. If we won’t be able to push ourelves beyond the current conception of the existing relations between humans entering very consciously inside the ongoing revolutionary process, every speech on the chance for "a new world" will, at best, be a revival of one of the old utopias. The capitalist society, which presents its wealth as an "immense accumulation of commodities", has wrapped the whole world in a single network of complex relations ruled by the law of value, by the law of exchange between equivalents. In order to be exchanged on the market, every commodity must have a use value and an exchange value. Which means it must essentially have two characteristics: to satisfy needs and to be comparable with any other commodity or with money, the universal equivalent of all commodities. If we consider the mercantile system, through its peculiar forms, to be an unceasingly extension of the relations among humans, then the specific capitalist mode of production arises as the very last form of the whole relations, grounded on the production and circulation of commodities. It differs from all the previous ones and goes beyond them as it frees (thus deprives of) the vast majority of humanity from the means of production. Indeed, in order to survive, the great part of the population is forced to sell its labour power to the few owners of the means of production: this way the labour-power becomes itself a commodity which can be sold or bought. At the stage of the centralization of the capital, moreover at the time of its financialization, this last form is capable of freeing capitalists themselves, expropriated by trusts and replaced by hired executives. The expansion of the market (towards its spreading throughout the planet) and money arise as being the fundamental instruments to the diffusion of "objects" having any sort of use for mankind. However, as soon as both market and money reach their maximum development the utility reveal itself as a pure appearance. The actual today's men’s relationship lays under the outer form: it is necessary since it is imposed by the aim of commodities circulation and the more general dominion of the Capital, neither it is led by the necessity to improve men’s life nor by the love of a man for another man. The principal aim of production is more and more often the production for the production and the paroxysmal accumulation of capital. The aim is not to produce objects but commodities; nor useful things but exchanged values; nor use’s values but money. The cycle of the societies based on exchange began when humanity passed from primitive communism to the first forms of production, so to surplus. First definition: within primitive communism there is yet no surplus or exchanges, only a common use of resources, a passage, a flow of objects and energy inside every isolated community. Only surplus allows exchanges, as the excess products have no use value. Different communities could have a need for the surplus of others, so that these producer's useless products acquire the use value they didn't have before, and become exchangeable. The contradiction of all the societies based on exchanges is that they rise onto the surplus of communities but lately, due to the relations of property (which are class relations), they naturally assure scarcity to the most part of the population. Property and social division of labour eventually revolutionize the productive power of communities. Surplus becomes huge and exchanges grows with it. Both technical and social new instruments are discovered, until they shows themselves as useless due to the level of absurdity reached by exchanges: today (thanks to the actual productive power of society), humanity is able to produce everything it needs. It could be able to nullify the "gap", the abyss that divides today's human communities (nations) and separates men inside these communities (classes) in order to achieve harmonious relations between humans and with nature. When these relations will be reached, the cycle of the societies based on exchanges (which began with the primitive communism) will be concluded: from the basic barter of the surplus it will have reached (trough a complex network of value exchanges) the very negation of the exchange. We can then rewrite our first definition by changing just three words which indicate the passage from the world of necessity to the world of freedom. Second definition: "within developed communism there is no more surplus or exchanges, only a common use of resources, a passage, a flow of objects and energy inside the whole community of the species"
Of course, this second definition is supplemented with the fact that the social productive power allows a total liberation from the primordial physical need while it allows the expansion of finally human needs. In order to well understand the historical lesson taught by the passage from the primitive communism to the developed one, we have to shortly describe what distinguishes an object from a commodity. According to the schematization used in the Capital, on the market commodities are compared to each other: C – C. We no longer write, for example, L – F (Leather – Flint), but the same letters for both, as long as commodities are no longer the specific and diversified products of a primitive community. As Marx says, their nature has deeply changed since today they hide inside their shell a social relation between men mediated by the relation between objects: they are socially produced but their value privately comes to fruition; they must be "useful" but they are produced only to increase the capital etc. That is why we can use the same letters: not only two commodities but all the commodities circulating on the market can be compared to each other through money, the general equivalent, which represents all the commodities and therefore all the social relations. In one case money is what mediates the movement of commodities, in the other commodities are the occasional link between money and money. While the first concept is quite straight forward (money mediates the exchange of two different commodities), a situation where the exchange of same amounts of money takes place through the mediation of a commodity is senseless: you can sell a television, get the money and then use it to buy a bicycle, but it would be silly to buy televisions and bicycles in order to sell them back for the same amount of money. Here we are talking about a society where commodities are on the average fairly exchanged according to the law of value, where the value is given by the average labour-time socially necessary to produce them. We do not care about the sporadic swindles among those operating on the market: within the capitalism, exchanges are mostly "fair". This model of the general circulation of commodities allows us to give a meaning to the M → M movement, where C is the mediating element, as the initial amount of money is quantitatively different from the final one. In its transformation into M1 money acquires a differential that can be represented in M → M + ∆M (the initial amount of money is increased of a ∆M quantity). The owner of money operates on the market in order to get more money than he had before. It may seem a break of the law of value which states that all the commodities are bought and sold on the base of the exchange between equivalents: according to this, the initial amount of money (M) should never be autonomously able to reach the valueM1 or M2 or M3, while actually the value increase is a rule. Moreover, as every exchange is "fair", no embezzlement exists: only an atypical transaction – bankruptcy, losses, dumping - could make M1 to be less than M.
The contradiction together with the solution of the problem must be sited in C. In fact money is always similar to itself while commodities change within the productive process, gaining value at each passage until its end in the final consumption. This flowing through comparisons of increasing value demolishes the stage of barter and start a real historical cycle through the mercantile system; it inexorably determines the ending into capitalism and the increasing the social productive power to finally lead to another one again different social system. Together with Marx, the goal of our research is to point out mechanisms that are pushing the actual society toward this future system. Once we have established C as being the element which causes the valorisation, we can write: C → C + ∆C (where C turns into C1). The transformation adds a certain quality to the initial commodity which is immediately a quantity of value: the only chance for it to allow the passage M → M1 when the product will leave the factory. It is clear that this metamorphosis of C applies in a moment when there is no connection to money. It is likely C had an independent life inside the M → C → M1 process for a certain period of time. Thanks to this passage, represented by the ellipsis, our hypothetical capitalist can obtain the commodity quantity MC, which will allow him to get the M1, increased from the first stage where he could only hand M.
We have showed (with the help of the same notation used by Marx) that the introduction of a new value in the sequence of exchanges must take place in the sphere of commodities, which seem to be able to do what money cannot: a self-valorization. In fact, while M → M1 would be nothing but usury (which happens when the differential of value comes from something external), the change that occurs in C…C1 is absolutely internal. But, in order to allow the value crystallizing itself inside the commodities, there should be a particular commodity having the property of dissolving inside all the other commodities during the process of production, thus generating the differential. That particular commodity is nothing but the labour power of the salaried worker. Consuming it and absorbing it, C can finally make its metamorphosis into C1. In conclusion: the simple exchange between objects do not produce new value nor the one between objects and money does; the new value is only produced by the application of the labour power. The importance of studying the productive process in its inner structure comes from the fact that the entire cycle where labour power is applied could be absolutely independent from the existence of value and money. The previous summarization of the fundamental concepts of the theory of value may appear superfluous to those who already know them, but we felt it was important to repeat them since it is not always easy to make connections within a studied subject. Everyone knows that the production is absolutely necessary in order to valorise the capital; nevertheless most of the analysis on the effects of capitalism do not take into account the structure on which capitalism is based. It would be a shame to study this mode of production without deepening its most important part - the productive process. Still, just few people really know the functioning of factories and their proper flow of operation, even people working in it. A remarkable portion of citizens in the most developed countries have a direct or indirect relation with the stock market speculation, which is not connected to production and which works like a roulette: M → M1. Some win because others lose, in anyway the bank cashes its share from winners and losers. Nevertheless, if Stock Exchanges were only pure speculation, they would more likely have survived as casinos’ branches. They are instead a fundamental element of modern capitalism even if, while widening the operative areas of capitals, they tend to group them together and make them more and more independent from the productive process of the single factories. The capital M tends to become M1 turning factories into simple machinery for the production of surplus-value, no matter how, even if it cannot live without them. Starting from the triumph of industry in the revolutionary period of bourgeoisie, we have now reached the triumph of circulation in its decadent period: still, only those capitalists who can exploit labour power and make real value flow into their shares will gain profits in the financial game, while those who try to take part of the same game with no power of exploiting the labour force will be ruthlessly stripped. Here is a closed link to what we are seeking: the Capital can be autonomous from the capitalist (who is nowadays substituted with salaried functionaries) but it cannot be autonomous from the factories, and the relation between Capital and factory is not bidirectional: Capital couldn’t do without factories, while these could continue their work even without the Capital, since there are no relations of value lying in them. Of course this is not feasible in a capitalistic environment – the actual mode of production is based on relations between factories trough the market, so through the value – but it points out that the bounds between capitalism and the future society are no longer structural, they are just political. The potential autonomy of factories from the Capital and the actual autonomy of the Capital from the capitalists represent a serious contradiction for the functioning of the whole system. All the factory managers are obsessed with it because, as they symbolize the productive process, they are enemies of the shareholders who instead represent the financial capital. The expectations of the shareholders are influenced by an insane circulation of capitals (M → M + ∆M) , running at a telematic’s network speed: the times of the financial valorisation does no longer accommodate the times of the production. In turn, the technical directors are only concerned about the production (C → C + ∆C) and they can’t do anything else but to guarantee the rationality of the production plan, regardless of the performances of the financial capital. The shareholders do not want to make long-term investments, while the technicians need it: they physically represent the contradiction between Capital and productive process. The continuously rising social productive power expressed by the factory founds its limit in the Capital, and is going to make it blow. The inner relations inside the factory are strictly related with the major contradiction of capitalism. Social production and private appropriation can only coexist at cost of an irrational use of the productive power: the waste is immense, the destruction of the resources is itself a resource for the survival of the Capital, the society is more and more anti-human and enormous masses of men are absolutely superfluous to the mere valorisation cycle M → M1. In this context, being the capitalists class turned useless and being the socialized production spread all over the globe (not only inside factories as before), the Capital is potentially non-Capital. Capitalism has an always growing need for an advanced, efficient, rational and programmed production based on automation, so on investments, but it paradoxically become the Cinderella of the system within the immense quantity of capitals moving on the markets. Being overwhelmed by the cycles of valorisation which are made increasingly shorter by the big capitals’ speculators will, factories are forced to constantly remodel themselves, trying to face the competitors and the demands for a more competitive production. By doing so, they exasperate the socialised conditions of the production, which, in turn, exasperate the primary contradiction of capitalism bringing closer the nemesis industry-production against the now aberrant firm-Capital relation which suffocates it. The obvious question is: what happens into p that makes M turning into M + ∆M and then into M1, M2, M3 etc...? If we take a little step back, we’ll see that the capitalists have to apply a particular commodity to the raw materials that enters the productive cycle, which is the labour-power. Having to guarantee the working of a very complex fabrication system and since a single labour-power (corresponding to one single worker) is not sufficient, they will buy the quantity they need on the market, paying for it as for any other commodity. The modern process of production (p) wouldn’t have been possible without the transformation of the ancient artisans, capable to manage an entire labour cycle (heterogeneous manufacture), into modern machine-workers (serial manufacture) whose task is to perform basic operations as parts of a complex system. The division of labour (which exists since the society began to organise itself and to produce) entered at first the manufactures, where forgers, tanners, wheelwrights, glassmakers etc… used to work, and went through a metamorphosis which turned the old artisan into the owner of a generic and undifferentiated labour-power. This is why Marx makes a distinction between the social and the manufacturing division of labour. If we banally consider it as a task-sharing among individuals, groups or wider men’s organisation, the distinction pointed out by Marx may not be clear at first glance. In fact the two divisions of labour represent two qualitatively different social phenomena. Paraphrasing Marx, we can say that the social division of labour operates a posteriori, being the product of the blind laws of market, of the total anarchy which leads individuals in placing themselves within the actual society. Since the action of each individual is determined by an immediate impulse related to an environment where the only law is the chaos, this chaos determines the distribution of the commodities coming out from the factory. On the contrary, the division of labour inside the factory (manufacturing division of labour) operates a priori; it is an factor of order surrounded by the social chaos: its prerequisite is the unconditioned authority of the production plan, of the perfect organizational machine without which capitalism would not even exist. The social division of labour sets every individual against all the others creating an eternal and ruthless competition, while the industrial division of labour causes men to cooperate: it introduces them in a system where the different contribution of everyone is perfectly integrated in the whole structure in order to achieve one prearranged result. The social division of labour is functional to the society divided into classes, it directly participates to the reactionary preservation of the capitalist society and it will be overcome in the future; while the organic division of labour that exists inside the factory is functional to a classless environment and, therefore, it anticipates the future social form: it is the ground for the liberation from the immediate needs that will therefore makes the reassembling of the complete man possible; a non specialized man, capable to satisfy multiple interests. Let’s take up Marx’s quote we opened this article with: it states that in the social division of labour the production of commodity is evident, while in a factory it isn’t. In fact, the individual worker produces no commodity inside the whole internal cycle. This is not difficult to prove. In the capitalist society every productive element that brings its final product on the market to gain surplus-value has a characteristic: that final product is a commodity. Whether we speak of a workshop or a manufacture or a modern automated factory, they are all the same when it comes to the production of commodities. The detail worker that participates to the internal division of labour in the serial manufacture (the heterogeneous one does not exists anymore) does not produce any commodity. Only the product (finished) of all details workers becomes a commodity, and moreover this will only take place when it will come out from the factory and get on the market. In both cases the relation between money and commodities is bidirectional (I’ll give you something if you give me something back) and can be written as M ↔ C. The central part of the scheme indicates that (as Marx states) "the detail labourer produces no commodities" and that "it is only the common product of all the detail labourers that becomes a commodity". If we consider the product of the detail labourer as a partial element which will compose the final product together with all the other partial elements produced by the other workers, we see no possibility of bidirectional comparison of value, neither with the starting product nor with the finished one. If a worker produces a raw bolt, another worker burnishes it and another one fastens it to piece of steel, then objects and operations are just linked by the coherence to one project. In terms of exchange value, no comparison between mechanical parts and between them and the processings makes sense. Moreover, the comparison itself would be useless as long as the goal of the productive process is not (at that moment) a valorisation, but a finished product. Only the sum between parts and partial operations will become an object having a use value and an exchange value, and it will be the result obtained by the collective worker, the social worker. That object will become a commodity immediately after it will be out of the factory, on the market: where not only every comparison of values is possible, but the comparison itself is the essence of capitalism. If we deny every quantitative and bidirectional comparison between those partial elements a commodity is build up with, thus we do so for a similar comparison involving the detail workers that have used their energy along every step of the productive process. By saying that the detail workers produces no commodities, we state that, inside the process of production of every single commodity (ruled by the production plan), there are no relations based on the law of value among the detail workers. So, inside the general cycle of the production and circulation of commodities (based on the commercial and bidirectional relations of the exchange between equivalents) we can find the relations that deny the Capital itself. They are revealed from unidirectional passages inside every single p passage contained in the process of production. Taylor's infamous production line can be taken as a symbol of a unidirectional flow. Given than partial product of every detail worker is only one of the numerous necessary stages to the final one, each worker or department provides one another their reason for existence within a kind of relationship which is totally different than the commercial one. Being no bidirectional passages of value, we can describe it as a flow of products, number of pieces, activities measurable in time or energy, but we can never talk about exchange of commodities ruled to the law of value. The passage from the heterogeneous manufacture to the serial one (and so the passage from artisans to detail workers) consitutes the passage from the formal subsumption of labour to the real subsumption of labour under Capital. This topic is treated in the Sixth unpublished Chapter of the Capital and we can here only briefly outline it; nevertheless we find very important to underline the importance, in the history, of this irreversible tendency towards higher and higher stages: capitalism reaches its maturity when it begins to base its existence on the extortion of relative surplus-value, namely when it learns how to greatly increase the value of products without increasing the hours of work nor the number of workers. When Marx studied this historical passage, his theory had its confirmation in the English automated factory, that "general automaton" which finally went beyond any old method. But the real quality leap towards the detail worker manifested itself a couple of decades later, not in England but, significantly, in the United States. Marx and Engels were arguing with Dühring while an American engineer, Frederick Winslow Taylor, after many years of work in various factories, was impressed by the backwardness of the organization of labour in comparison with the modernity of the instruments, and decided to devote himself to a real and complete transformation of manufactures. Even though he didn't know Marx, he took to extremes his considerations about the becoming of the productive cycle at the time of the extortion of relative surplus-value. The Chairman: "Would it not be natural, then, be in the mind of the workingman who has no other resources except his earnings from day to day that he must conserve his earning power so as to last him through the longest possible period of his life?" Mr Taylor: "In the past the man has been first; in the future the system must be first; the first object of any good system must be that of developing first-class men;"
The chairman seems to evoke Marx and Engels; even though he carries out to the death a defense of his method of super-exploitation including ahighly-embellished romantic argumentation on idyllic interclass collaboration, he can't help being even more pregnant: he does not want individuals, but cells of an organism. He complains about people still being unable to understand what his method consists of after 30 years; so he accuses capitalists to slow down the revolutionary (he uses this very word) development of the productive forces. He admits that, thanks to his method, the production is often three, four or even more times bigger than before while salaries are, at best, only doubled; but he garantees that worker are less "exploited", which, following current idea, means that they save their energy more than before. According to data he owns, he demonstrates that they in fact do not strike anymore. He warns that the factory is the place of abundance and that its production is unlimited, while outside of it misery and famine abound. Taylor insists on the new method to be seen as a real social revolution, not just a simple sum of techniques to increase production. Factory is full of industrial workers but, until now, they have merely been good artisans. They can do their work with a wealth of specific knowledge but they restrain the potential production. Factories' directors are even more backward, as they are stuck on the tradition of "capable" and obliging workers. The main advantage in introducing the new system does not come directly from workers; it occurs in the new vast duties that the direction must hold. They have to understand that a radical change in mentality is necessary because a revolution is on going, not because a manual says it. It is time to organize the factory in a different way than on the base of the social division of labour which nonetheless have been its historical root. The first responsibility that the property has to assume consists in stopping to simply tell workers what they have to do and to not worry about anything else. It must rip the individual knowledge out of workers and kill the artisan living inside of them. "The duty of the gathering in all this great mass of traditional knowledge and the then recording it, tabulating it, and, in many cases, finally reducing it to laws, rules, and even to mathematical formulae, is voluntary assumed by the scientific managers." [...] a science to replace the old rule-of-thumb knowledge of the workmen; that is, the knowledge which the workmen had and which was, in many cases, quite as exact as that which is finally obtain by the managment, but which the workmen nevertheless in nine hundred and ninety-nine cases out of a thousand kept in their heads, and of which there was no permanent or complete record. So, first thing, get rid of the worker-artisan and create the detail worker: the productive intelligence moves from the individual to the system, it is no longer transmitted from the worker to the apprentice within a personal relationship; it becomes a permanent social knowledge that can be transmitted through a collective education (courses, books etc…) to a huge quantity of people at one time. The second responsibility is to scientifically select the workers inside the productive process, instead of hiring them on the base of what they say or feel about themselves outside the productive system. Since science is "a classified and organized knowledge", it is fundamental to carry out an objective survey inside the factory before allocating workers to the productive operations. Criteria of the survey are to consider specific training made during the entire work-life of the worker, totally excluding his previous experience which is to be seen as individual and incoherent. The artisan gives his stamp to the factory, while the detail worker is shaped by the factory. The artisan works as an individual among other individuals, the detail worker is "a piece of an integrated operating system". The third responsibility is to program the process of integration between science and worker: "I say "bringing together" advisedly, because you may develop all the science that you please, and you may scientifically select and train workmen just as much as you please, but unless some man or some men bring science and the workman together all your labor will be lost". This acts as a totalitarian imposition so it needs an authority capable of achieving it: that is why the nine-tenths of the responsibility in this sector apply to the direction, which is often unable to represent the production plan, causing everyone to go back to the old habits. The fourth responsibility is, according to Taylor, the most difficult to comprehend for the society of his time: while worker loses the knowledge of their art/craft, the management itself must forget its old prerogatives: the direction turns to be useless if it simply acts as a watchdog. New organisation of work split worker's tasks from direction tasks: the organizational work as a whole previously done individually by every artisan (and which took about one-third of the total labour time) now goes to the management, who loses its free will and becomes and integrated part of the system, just like every worker. All of this (both in the audition in front of the commission and in the principal Taylor's book) is drowned by an incredible number of examples and uplifting statements on interclass' collaboration; nonetheless within this confusion we cannot help us from reading two clear and important statements: 1) the old social division of labour is forever thrown out of factory; 2) the final purpose of the scientific management is not to merely elevates the surplus (profit + salaries), since this would simply worsen the class conflicts for its sharing; its actual aim is to so much increase the production through the integrated factory than the resulting surplus eliminates itself any reason to contend for. Everything has been said above is ingenuous if we think about classes, but it is exact in terms of the liberating potential of the production related to Humanity. Taylorism is today considered as an anachronistic and mechanical approach to the organizational issues, and this is because bourgeoisie is unable to understand its own achievements in the dynamic of history. Of course it would be absurd to organize a modern factory with the instruments used by Taylor (or others at that time), but the essence of his method is not in the instruments; it is actually in the extraordinary realization of the Total Factory, instrument of the Total Capital, in the epoch of relative surplus-value. A bourgeois is unable to see what is useful to a communist. The general concept expressed both by Marx and Taylor is not to be found in the assembly line, in the chronometer or in the time-and-motion office, but in another type of transformation of the factory: the previously hierarchically organized and separated productive units turn into an integrated horizontal whole of functions organised as a net where no discretionary element exists (not even at the ownership level), where everything is ruled by the authority of the production plan. The Capital - as foreseen by Marx - doesn't just dominates upon subsumed work in a real way, it also dominates upon capitalists themselves. This whole of functions is today not only organized as a net, but also into a net, which means that it has took over the computer networks at first and then it has submitted itself to them thanks to global instruments as the Computer Integrated Manufacturing. As such instruments can be shared by many factories, even the smallest company becomes part of a wider system which goes beyond company borders; rather than being a choice, it is the only way it has to face the comptetitors and avoid being overcome. In one of the many books published on this topic (La fabbrica intelligente - The intelligent factory) it is underlined that the core of the new industrial organization is not in the machines (computers included) but in the softwares which allow them to "think", especially in the global production program, which constitutes the real software of the factory. In a comparative analysis among different companies (big and small) a common characteristic emerges: whether they are computerized or not, detailed activities must be responding to an interconnected and integrated whole finalized to a target. This is why computerization is possible. If no invariant structure existed within every factory, no software being valid for every single informatic industrial system could be produced and sold. The analysis of a productive process conducted with Marxist criteria can't be compared to the bourgeois' one. The problem is clearly not technical, but political. The proletarian conquest of the hegemony inside the bourgeois society through the acknowledging and the conquest of factories is a huge Gramscian foolishness which would not change anything about the condition of the proletariat: the organization of factories is already functional to the future society; what has to be conquered is the outside, through breaking the relations of property that impose the whole class system on which it's grounded, including the law of value and the exchange between equivalents. It is outside the factory-prison, on a territorial base, that workers must organize themselves politically. Also for this reason, from the point of view of the future revolution, it is important to focus on the global structure of the Capital instead of being stuck inside the walls of the factories. It is not a matter of conquering the power, it is about (once the power has been conquered)the possibility of using instruments which are already in accordance with the new society. Industrial organization itself has today already overcome the limits of the single factory and has come out of it. Today it is more and more necessary to make separated processes of different factories comparable and to have an immediate perception of the productive capacity (according to given quality and compatibility standards). The production plan, which was at first specific for each productive unity, tends today to become universally valid. Every once separated characteristic only connected through the use of standards (measures, components, sizes) is today unified following schemes that can suite every productive plan. They are absolutely impersonal, crystallized into such detailed, experimented and formalized norms that new factories can even be planned and built according to them. Further more they are available for everyone at special international organisms (e.g. ISO, International Standards Organisation). These universal organizational schemes offer us the experimental test of marxist theory's assumptions: the law of value is based on the production-market couple, but production itself has no need for the law of value. We will offer some examples taken from some specialist press. Modern organizational theories are no longer called Taylorism, even if here the use of "ism" would be here so much more appropriated than in other cases, but what matter to us is the essence, not its definition. A good reference point for what we want to demonstrate is the so-called value analysis, the essential element of every standard scheme of total quality management. Contradictions of this method is anticipated by the title: the value that these schemes refer to is not the exchange-value (generally identified as the price by various authors) but something much more ambiguous, as we will see. During WWII the value analysis was generated from the necessity to feed the immense American destruction-machine without making the internal economical structure to blow. After the war, military occupation of the defeated countries required even more organizational resources. The initial goal of reducing the costs within a critical social and productive situation then became an actual international plan of industrial reconstruction and rationalization of the resources. At that time many of the procedures used were refined and began to be called Value Engineering, until they were bound to those complex of norms and procedures lately called total quality management. It is impossible here to properly describe that new scheme since that way of screening the productive process is in itself the mirror of the whole factory; notwithstanding, in short, let's explain it as the collective and multidisciplinary action of an internal organism that uses single elements hired in all the neuralgic phases of the, broadly speaking, productive process: starting from the definition of the product on the base of marketing researches, ending to its definitive released in the market. 1) Orientation: the preventive plan of the entire operation. 2) Information: the operative research of all necessary data, the fundamental point: today the term "information" no longer simply means "piece of information", but a complex of knowledge that an organism must have to know itself and to self-organize. 3) Functional analysis: be careful, the term is used in its mathematical meaning, which is to link various parts of a process and the results "in function of…" (a variable is always in function of another variable, therefore the process must always be seen in its global dynamic). 4) and 5) Research of the solutions and their evaluation. 6) and 7) Forecast, decision and monitoring of the realization. Such a list of points, with more or less items, is common to all the authors who cope with such matters, but it is usually carried out following individual (so variable) inclinations. What remains constant is the sense given to the word "value": despite what you would expect from clever technicians capable of drawing amazing projects, it is considered as the mere quality-price relation or, to go straight to the point as a shop owner would do, the optimal degree of satisfaction between the producer and the client. A technician is unable, and not capable of, figuring the products without its relation with money, which from start to end of the cycle, characterize a commodity. To us it is immediately clear that the enormous apparatus of knowledge and technical operative capacity carried out inside a factory (consider there's not just the value analysis which we here take as the only example) is totally independent from money. It is indeed only related to the satisfaction of human needs. To the bourgeois, on the contrary, only the market leads the organization of the factory, since he is slave of the competition that constantly reshapes industries. Marx claims this fact as the main reason for the great productive power of this specific way of production (capitalism) and, at the same time, as the instrument of its own end. Capitalism is transitory but its productive apparatus will live until the new society won't develop something better (this will be with no regrets about the death of the famous value). Let's take the definition of "productive system" from the above mentioned book on Total Quality: "Each man-machine system like must be considered as an ensemble of elements living within a dynamic interaction, organised for one goal, each of them exchanging matter, energy and information with their environment. That is why it is opened, as our apartment, our car, the town we live in, an off-shore platform, every industrial complex" (non official translation). The author defines such system as opened in order to underline that it challenges a physical law, the second law of thermodynamics. Opened systems have this peculiar property consisting of interacting with the environment they are a part of: they accumulate information and gain self-organizational skills; in a way they can self-program in relation to a goal. On the other hand, closed systems only transform the energy and matter they own and tend to chaos. According to how we look at it, the industrial system is to be considered both opened or closed: this duplicity is due to the existence or not of capitalism. In the following images they are separately schematized: 1) represents a single industry inserted in the market (opened/closed system); 2) represents an industrial system inserted in the market (closed system); 3) represents the same industrial system within a society without money and market (opened system). In the first image the scheme shows that it is necessary to buy raw materials, energy, semi-finished products and labour-power on the market, in order to start a productive process. The relationship between the producer and the supplier is mediated by the exchange between equivalents, between money and commodity and vice-versa. Once that raw materials and energy have entered the productive process they will generate a series of consequential transformations that will lead to the final product, packed and stored. Cycle of these transformations is projected, programmed, executed and controlled: each step is taken (as we saw) "in function of" every other ones. The organisms performing such functions are interconnected and integrated, as a whole, they stand for the global production plan being consistant with the goal. Each step of the process, each relation among multiple subjects of the system is represented by bidirectional (↔) and unidirectional (→) symbolswhich are placed in precise areas of our scheme. The area of the market is characterized by the social division of labour, while the area related to the factory includes an ensemble (organic and no longer heterogenous) characterised by the manufacture division of labour. Outside the factory, which means in the area of the market, value relations operate basing themselves on the exchange between equals as shown below. Figure 1. 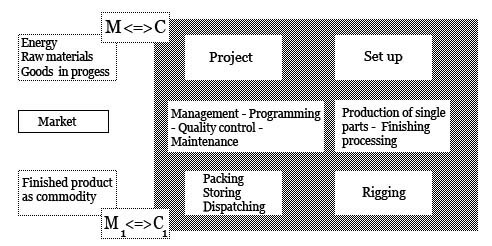 Opened/closed system: inside the factory, exchanges are not based on the law of value but following criteria of quantity and functionality; the arrows indicate both the productive flow and the double-directional exchange of information. The system is contradictory: it would be opened if the market with its forcing the products to the bidirectional relation with value did not exist. Figure 2. Closed, dissipative system: there is a contradiction between the flow inside the factory (passing of physical quantities) and the outside (market, value exchange). Each industry and each consumer is isolated inside the market, their relation being done through money, therefore there is no organic flow. The set represented by the rectangular perimeter is necessarily chaotic. Figure 3. Opened, organic system. There is no contradiction between the inside and the outside of the factory. Vertical arrows indicate an exchange of energy and matter with the environment, while the horizontal arrows indicate the flow of products (or exchange of energy and matter) between different industries and between these and men. At the entrance and at the exit of that subset represented by the factory there is always the bidirectional relation "↔" between M and C (and so between M1 and C1): this symbol not only represents the social division of labour but also the whole society upon which the whole process of circulation and valorisation of the Capital is based. This last statement is fundamental to answer to those distracted readers that once blamed us for having utopian visions of small islands of communism inside this society: if we do consider the set named "market" which includes the factory as a subset, there is absolutely no communism island but just capitalism at its maximum development. However we also have to ask ourselves: can a subset be analyzed as a set (with its own subsets) regardless of what is around it? The answer is one of those irritating the Manicheans: it cannot be yes nor no, it is actually "it depends". We said above that the set called "market" and the subset called "factory" are only one capitalistic unit. It is true: with the help of the ensemble theory, if we take the subset "factory" and we consider it as a set inside the complementary set "market", the latter will match with the only universal set. Anyhow no one can stop us from referring to the "factory" as something separated from "market" (factory having itself subsets with no internal value relations) if we clearly delimitate the field of this operation, which means clarifying that the limit the factory-set crashes into is the set M↔C. Inside the productive process, connections between different functions are represented by a unidirectional arrow (→): indeed every function expresses a particular need imposed by the general productive plan. The flow of information (being operative decisions, managing of selling/contracts, storage control, managing of maintenance, transformation and storing services for the raw material and the final produt) must occur in an unidirectional way. The double direction is essential, but it only occurs in terms of information, which, inside the set "factory", is a mere use value. Anyone having just the slightest idea of how a productive process works immediately understands that the existence of a bidirectional relation between workers would just be absurd: "I give you my product if you give me something back". So the sign "→" isn't nothing but the negation of the sign "↔". If it is true that the capitalistic set only includes factories with the unique scope of increasing the Capital, it is also true that the cooperation of many detail workers (that is the collective worker who realizes the production plan) shows the negation of the law of value. It is perfectly comprehensible that, after decades of falsification and erasure of the revolutionary theory, it can be difficult to recognize the functional elements of the process of valorisation of the Capital and, at the same time, to see in them their own negation. But it is necessary to go back to the basis of the theory. Studying on Marx's texts the history that brought to the formation of the modern Capital is essential to regain possession of the least dialectic skill which helps us to understand how historically determined the rise of capitalism is: that dynamics which turns an individual process of manufacturing into a global social process. At the same time we would understand how historically necessary its death is. Without this dialectical link it could seem at least quite strange that, presenting ourselves as communists and so as enemies of the actual society, we allow us to take some of its fundamental elements as models. As a matter of fact, we do not claim any element of capitalism, but basing ourselves on those who came before us, we simply pinpoint its physiological contradictions, those that it has already brought to their maximum development and that already show its negation. The future society will not be based on the social division of labour and it'll use the functional division between members of society but certainly not the way it occurs nowadays inside the factory-system: together with the compulsory work it will, above all, extinguish the millenary separation between labour-time and life-time. In a beautiful passage of his commentaries to a Mill's text, Marx states that the capitalistic relation between men is an instrumental relation with the aim to take possession of each other product and that the meaning of life becomes the exchange itself, which means the struggle. In a human relation, instead, the aim of life is the satisfaction of human needs through the production for each other, so that labour does not differenciate itself from other people's enjoyment, since "this relationship would moreover be reciprocal; what occurs on my side has also to occur on yours". Labour would be a free manifestation of life and therefore its enjoyment. Moreover, through the extinction of the egoistical individual, the peculiarity of the individual skill would be exalted. The whole detailed operations will not result from the action of the social worker, but it will become the differentiated contribution of each individual to the life of the man-society. We strongly underline the modern concept of cooperation, the potentiality of the integration of all the productive forces over the globe to physically realize the organic unity for the production of the specie within one organic and global ensemble. And we exalt these results of species life, while the bourgeois exalts the market, the competition and the blind action of natural forces, which means the primitive, animal, relations between humans, the struggle for existence, the Darwinian selection. Bourgeoisie exalts for propaganda purpose the great achievements of science and industry, of the organization of labour and of the rational productive plan, sometimes with Enlightenment-like, out of time, tones, sometimes pretending an acknowledgement it doesn't have and sometimes (as it occured with fascism) pushing this until the economy control. However it ideollogically shows itself as hysterical and it excessively fills with indignation in front of any prospective of conscious project in the social productive process, as if it was a blasphemy against the inviolable rights of property, against the free personal enterprise and against freedom of capitalists who do not even exist anymore as such, being today actually mere functionaries of the Capital. Bourgeoisie doesn't realize that by doing this, it spits over its own revolution and exalts the bellum omnium contra omnes (the war of all against all). As Marx says in the already cited Capital's chapter XII- First Book: "It is very characteristic that the enthusiastic apologists of the factory system have nothing more damning to urge against a general organisation of the labour of society, than that it would turn all society into one immense factory". - Karl Marx, The Capital, Book I, Chapter XIV, "Division of labour and manufacture"; Chapter XII, "Co-operation"
- Karl Marx, The Capital, Book I, Unpublished VI Chapter, La Nuova Italia. - International Communist Party, Elementi di economia marxista (Italian only), Quaderni internazionalisti. - Karl Marx, Comments on James Mill's Elements d'economie politique. - Frederick W. Taylor, Scientific Management. - Various Authors, La fabbrica intelligente (italian only) , Franco Angeli.